Reaper has started their 12 Days of Reaper sale. Go take a look-see. Here are the figures we're using for this year's 12 Days of Reaper Promotion. We're also releasing Jason Wiebe's Santa Dwarf miniature. 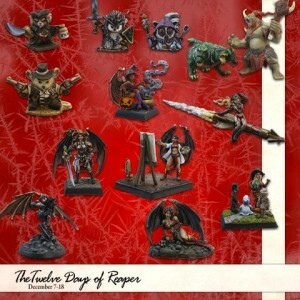 This Special Edition miniature will only be available during our 12 Days of Reaper promotion. On December 18, Santa Dwarf will fly back to his Toy Shoppe/Brewery and will not return again until next year. 01525 Santa Dwarf is $10.